Is The Extension Deployed? How Can I Redeploy? This is a question that comes up every so often in the forums. Unfortunately there is no place, I am aware of, where this really gets explained and it seems to require the knowledge of mysterious URL’s. Is there an easy way? I wanted to always blog this, but somehow I just never did. Let’s unveil it now. The deployment process on Tomcat and WebSphere Application Server (WAS) is basically the same. 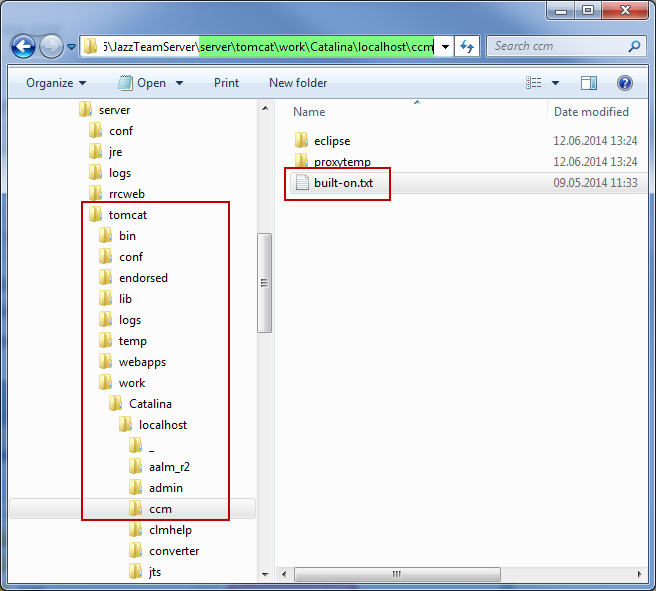 The folders where you deploy the extension are the same within server/conf/ccm . The mechanisms described below work the same for WAS, except the location of the file built-on.txt. The best way to check if a server extension is deployed on a server is to use some Internal Tools. These hidden Internal Tools are also the easiest way to enforce redeployment of the applications and added extensions. The internal tools can be accessed by injecting the string ?internal=true into the server administration URL for a Jazz application. This makes it available on the Server Administration page. It is possible to append the string above behind the URL for the main administration pages and then open the server administration. If the server administration page is already open and it contains an action the string needs to be injected before the # (hash tag) separating the action from the base URL. The image below shows the injected string in the server administration page before the action. The image below shows the URL when just appending the string before opening a specific server administration page. shows the internal tools menu that can then be used to look at data that is usually not revealed. Use the Component Status menu action to check if an extension is deployed. 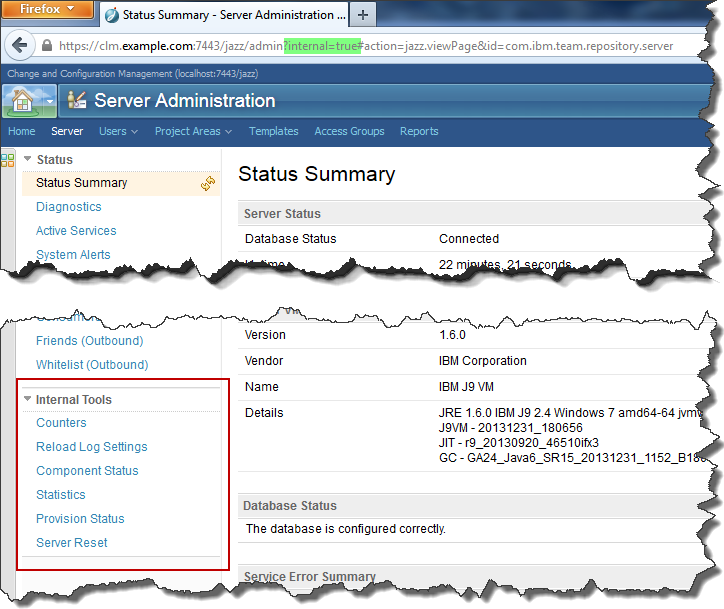 It opens the Component Status page with all components that are deployed. You can then use the browsers find functionality to search for your extension, or rather the name of the component you chose. If you followed my advice and chose a unique and easy naming schema, you should be able to find it. The image below shows the example of the RTC Extensions Workshop at the end of the list. Searching for rtcext revealed this in no time. If your component does not show up, fix your deployment and try again. Use the Server Reset menu action to trigger a re-provisioning of all extensions. Reboot the server after pressing the button. If a new version of an extension is deployed, this makes sure that the cache gets deleted and all the features, including the new version, are re-read. This is the most secure approach. The runtime of the Jazz servers caches information about deployed applications. If a new version of an application is deployed, the server would not pick that up and would not redeploy it. To enforce redeploying, it is necessary to request a server reset. There are several ways to do that. One way is to use the Internal Tools and click on the Server Reset menu action. On the page displayed, click the Request Server Reset button. Next time the server is started, all plugins are redeployed. If your server is not up, another way to enforce a server reset is to search for the file built-on.txt in the work folder of your application server. If this file is deleted, a server reset is performed the next time the server starts. For Tomcat you can find the file in the work folder of the application. For the traditional WebSphere Application Server you should find the file located somewhere underneath the profile folder. For the WebSphere Liberty Profile application server, you should find the file located somewhere underneath the workarea folder. E.g. in [Install Dir]\JazzTeamServer\server\liberty\servers\clm\workarea\. Please note that the built-on.txt file is also located in WEB-INF folder in the WAR file and in the WEB-INF folder of the deflated war file. Don’t delete these files. The Internal Tools provide an easy way to find out if a custom component is deployed and to request a server reset. As always I hope this helps practitioners out there to be more effective.